My 5th grade GT students study the “Dimensions of Character.” This 8-minute film, “The Science of Character,” says everything that I hope they will learn from this year. It stresses that you have the power to develop your own character – and that you can also shape the character of other people. The video cites brain research that supports these ideas, and also cites Carol Dweck’s work on mindsets. The video asks the audience to think about your own top five strengths. You can access the ones you have identified to be the most important on the Periodic Table of Character Strengths, and you can click on each one to learn more about it. This is a fabulous resource. It not only gives the definition of each strength, but links to films, books, and other websites that give examples of the strength. The site also offers film discussion guides for every level, from elementary to adult. 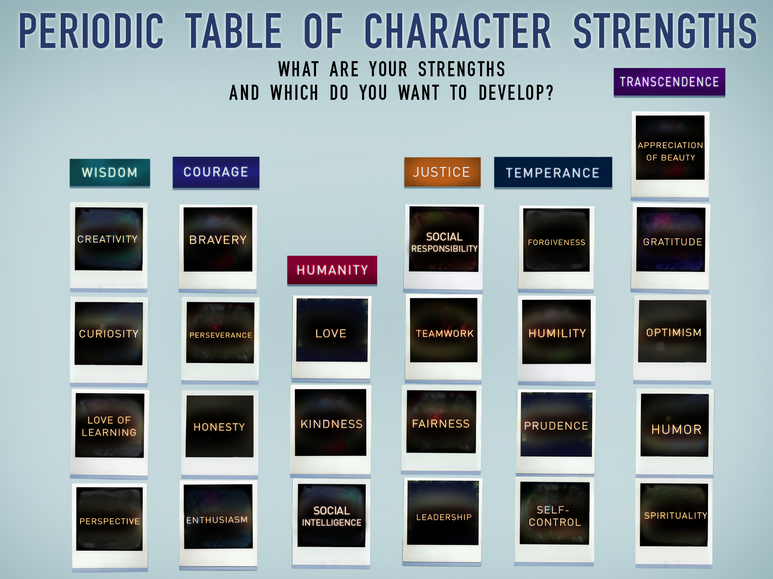 There are many additional resources on learning more about character strengths, as well. There is a link to a Character Strengths Survey, but that requires log-in information that I would not recommend be entered by students under 18. I am definitely planning to use this with my 5th graders. Last year, using an idea from Angela Maiers, I asked my students to choose their own “Dream Team” of people who demonstrate the traits they most admire. (You can read more about this project here.) The “Science of Character” film and resources fit in perfectly with this project. I want to thank “Let it Ripple” for providing such a wonderful supplement for classrooms around the world! Excellent movie and project. This topic also took a big step forward with Aristotle’s “Nichomachean Ethics” and many books since then, but hey, more is always good. This is definitely more accessible and engaging for kids. I wonder if you are familiar with The Happiness Project or The Longevity Project? The latter is a fascinating book. More scientific and evidence-based than most things. This post is reblogged from Terri Eichholz’ excellent Engage Their Minds. Not only is it great to consider where our readers are concerned, but also in terms of fictional characters!